The MTA is implementing new changes to the Q36 Little Neck branch inspired by Little Neck LiNk after Labor Day. These include tethering bus departures to Peak PM train arrivals as well as redesigning the Little Neck terminal of the Q36 to be more conducive to commuting (through bus stop balancing and reversing the terminal direction). Although the erratic AM Peak LIRR schedule prevents specific Q36 bus trips from being assigned to LIRR trains, frequency during AM and PM Peak hours will be reduced to one bus every 10-15 minutes. These improvements will increase commuter confidence in the Q36 Little Neck branch and will ultimately lead to higher ridership numbers. This is a major victory for our communities, one that will pave the way for even better solutions after the bus network redesign. Jacob pointed to a recommendation made by the Bus Turnaround Coalition for routes in the city. “The other thing is that you’re lengthening the route, which may actually impact how reliable the service is,” Jacob asserted. The original idea of LiNk was born out of the philosophy of using existing bus infrastructure to provide additional service to our communities while not subtracting service from any other community east of Little Neck Pkwy. Reviving the Q79 was seen back then as not probable. However, with the MTA Bus Plan and its network redesign focusing on bus efficiency, replacing the Q36 extension with a new Q79 is one again feasible. The Bus Turnaround Coalition reports that the Q36’s ridership has grown 11% since 2010, which makes the revival of the Q79 an even more attractive proposal for the MTA. The current alterations will act as a test for the demand of Little Neck Pkwy bus service; if enough people ride the new Q36, then we may once again see the Q79 by 2021. The Q79’s revival plays right into the hand of efficient, low turn, low length bus routes supported by both the Bus Turnaround Coalition and Andy Byford’s Bus Plan. When the MTA was considering increasing Q79 ridership in the 1990s, one of the suggestions presented was to extend the Q79 to the Floral Park LIRR Station in a triangle loop via Tulip and Carnation Avenues. This was met with widespread criticism from Floral Park, Nassau County residents, who complained about traffic congestion and bus stops removing parking spots from their neighborhood. Some speculate that an underlying worry about Queens residents using the Floral Park station was also present. Regardless, one thing was certain: this route configuration, created only to serve as an extension of convenience, provided very little additional service for Floral Park residents while placing buses and stops within their neighborhood. Figure 1: Q79 Triangle Loop as previously proposed. Meanwhile, residents of western Nassau have had their own transportation issue: a lack of connection between the different horizontal routes operated by both the MTA and TransDev’s NICE bus network. The northern horizontal routes (the Q12 & n20G at Northern Blvd, the Q30 at H. Harding Expy, the Q46 at Union Tpke, the Q43, n22, & n26 at Hillside Ave, and the Q36 & n24 at Jamaica Ave) and the southern horizontal routes (the n1/n6 at Hempstead Tpke, the n4 at Merrick Rd, and the Q5/Q85 at Green Acres Mall) were not connected to each other, with the n2/n8-turned-Elmont FLEXI terminating at Hempstead Tpke and the Q79-turned-Q36 terminating at Jamaica Ave. In addition, the neighborhood of Floral Park in Nassau is entirely devoid of bus service, with no convenient way for its commuters, students, and seniors to access vital community resources. A proper extension of the Q79 would do that. 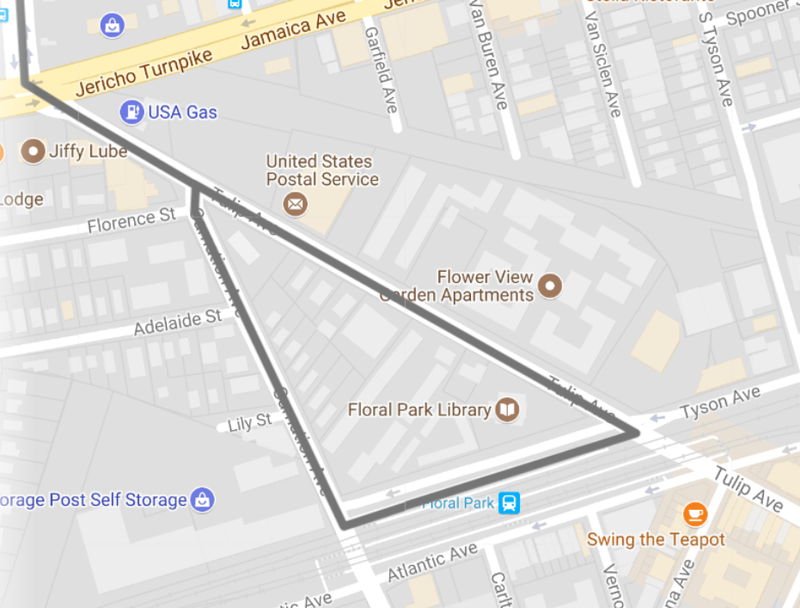 Pictured below is my proposed extension of the Q79: it would turn onto Tulip Ave and travel on it until Plainfield Ave, where it would turn southward and travel down to Union Tpke, connecting with the n1. The existing n1 bus would do the work of taking residents south to Merrick Rd and the Green Acres Mall. 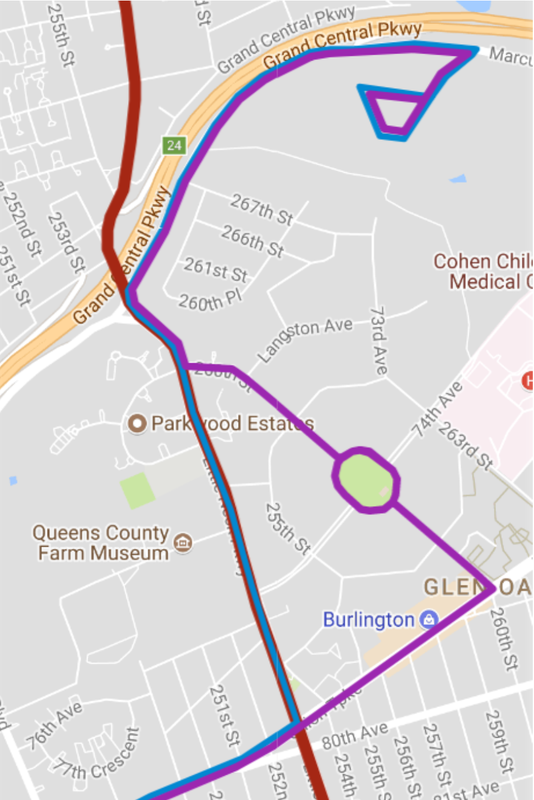 A new triangle loop would be established where the Q79 makes two right turns: one from Elmont Rd onto Hempstead Tpke and one back onto Plainfield Ave from Hempstead Tpke. 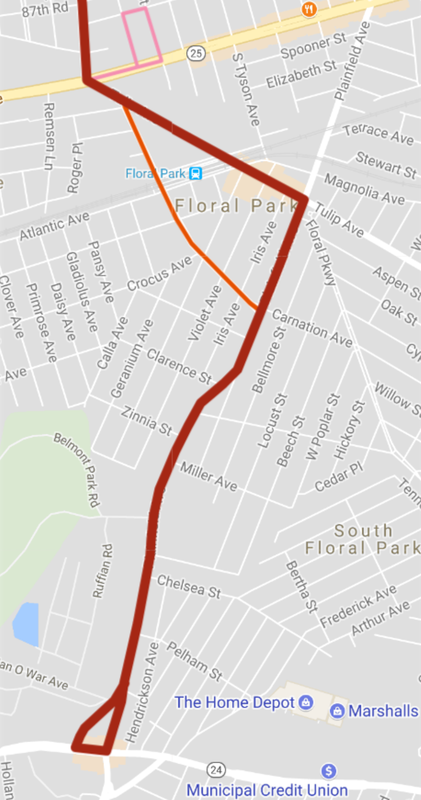 This creates a relatively straight and clean Q79 extension southward while still connecting Floral Park to its main small business district and the LIRR station. The new MTA philosophy of bus stop balancing means that the parking loss will be more minimal than before (with very few bus stops being added to the Q79). If parking loss in the central business district is of major concern, the Q79 could turn south onto Carnation Ave instead, although those without cars would find it to be considerably more difficult to access local businesses. One of the biggest suggestions I got for LiNk was local bus service to the North Shore Towers community. Currently, the North Shore Towers only has access to the QM6 and QM36, both express bus routes that provide service into Manhattan. There are three main issues with the current setup. 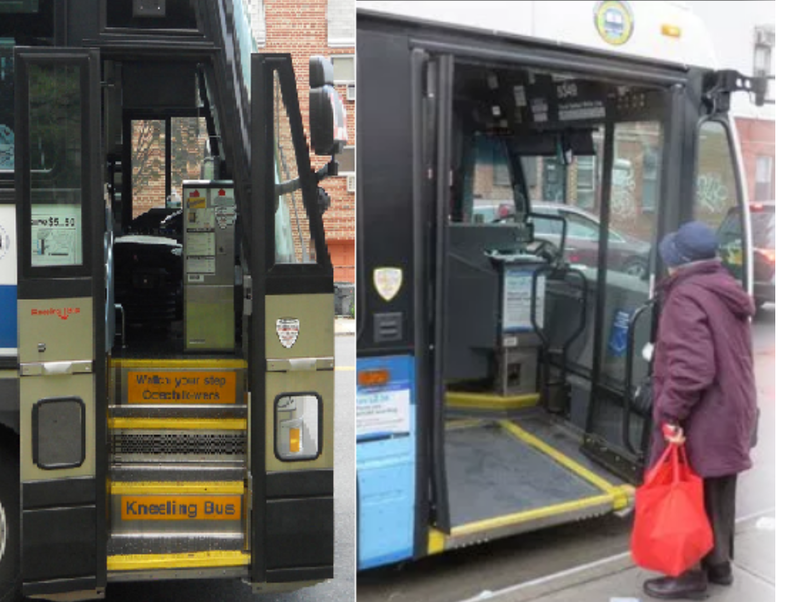 First, express buses are high-floor (meaning that there is a set of steps you must climb to board the bus), which means that senior citizens and those with disabilities find it more difficult or time consuming to board the bus. Boarding a wheelchair bound passenger can sometimes take upwards of twenty minutes, and some drivers either don’t have the key to the wheelchair lift or don’t know how to operate it properly. Second, many caretakers of North Shore Towers residents (who don’t live in the Towers themselves) have to walk to the Northwell Health campus to take the Q46, in a road infrastructure built for cars. One bus driver on the QM35 who I conversed with while commuting to my university notes how he used to pick up caretakers for free on his QM1A (now QM6) bus (against company policy pre-MTA) and drop them off at the hospital to take the Q46. Finally, North Shore Towers residents are limited in their commute options; there are no alternatives if the QM6/36 fail. There is also no downtown express service or connection to the LIRR. Having an extended Q46 branch to the Towers (either via 260 St or Little Neck Pkwy) would allow caretakers and North Shore Towers residents alike take advantage of Queens bus and rail connections (currently shuttles operated by the Towers only connect residents to Nassau County shopping destinations). The MTA’s willingness to redesign our bus network to function better for our communities is an unprecedented opportunity to fix decades-old transit problems that face Eastern Queens and Western Nassau, communities far from Subway and commuter rail connections. It allows all of us to gain better access to our small businesses, community centers, houses of worship, doctor’s offices, and opportunities. Significant changes are coming to the way we commute, and, with advocacy, our communities can be at the forefront of accessibility.